Sending your car into the workshop can be a stressful experience at best. With no guarantee that your car will come out the other side unscathed, there’s also the added inconvenience of being unable to use the car while repairs are ongoing. Allan Wan was one such Singaporean who had to go through the ordeal. To make things worse, the auto shop suddenly closed down, leaving him with a missing car. 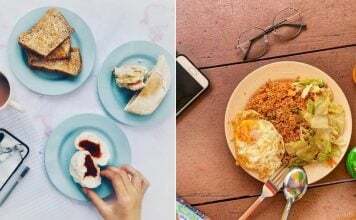 Strangely, he would also receive a fine from the Land Transport Authority (LTA), claiming his car had passed by an ERP gantry with insufficient cashcard value. Which meant somebody was driving his missing car around, only without bothering to pay for the ERP. Odd? Indeed. 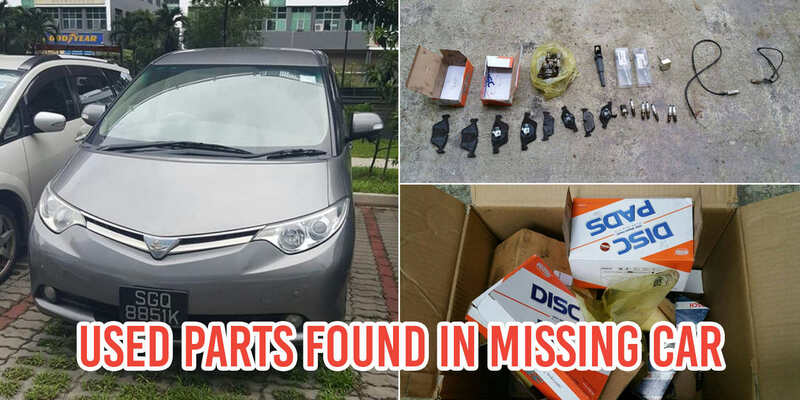 But more importantly, Mr Wan would later find his car — banged up, with a extra 975km of mileage, and a box of car parts. In a Facebook post dated 4 Mar, Mr Wan detailed the process he went through at the workshop. 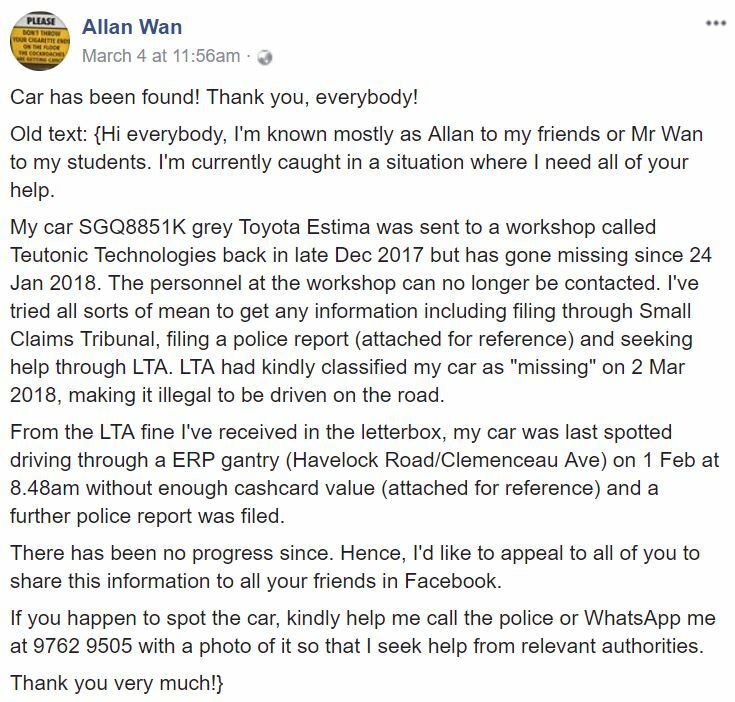 Basically, Mr Wan sent his car to Teutonic Technologies at Sin Ming in Dec 2017, and later demanded $4,500 for repairs, an amount he refused to pay, as his Toyota Estima was supposed to be under warranty. According to STOMP, Teutonic then sent his car to another workshop on 24 Jan without his knowledge. They also claimed that his car would not be released until Mr Wan paid the invoice. So he went down to the other workshop on the same day, and was told that the car had already been collected by the Teutonic staff that he had been in contact with. However, when Mr Wan went down to Teutonic, the shop was closed, and the staff was uncontactable. 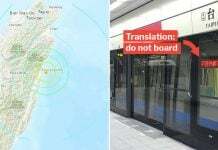 He made a police report, and his car was eventually classified as “missing” by LTA on 2 Mar. 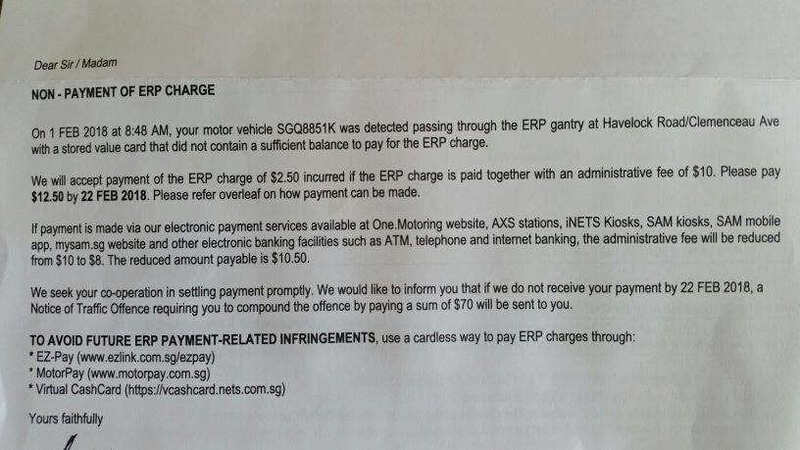 Because on 1 Feb, about a month after he sent it for servicing, Mr Wan’s vehicle was found to have passed through an ERP gantry with an insufficient balance. As a result, the ERP charge was not paid. Which actually meant that somebody was driving his car around Singapore while it was missing. 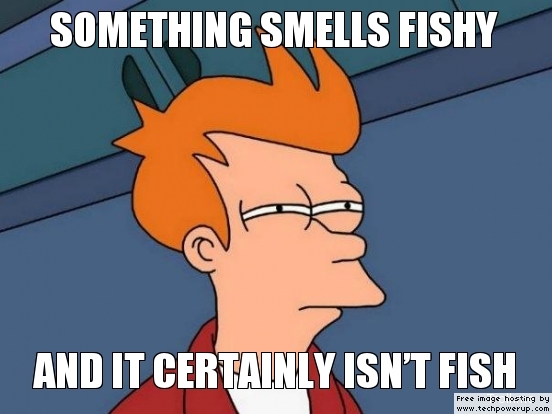 And avoiding ERP charges while doing so. 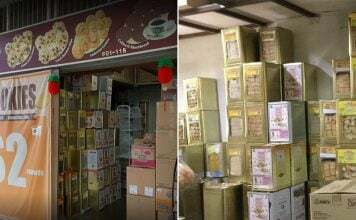 Three days after posting the Facebook status asking for his car’s information, the police informed Mr Wan that it was found along Sunrise Lane. Except the car wasn’t exactly the same car he had lost. Here’s Mr Wan’s update in case the one above doesn’t work. 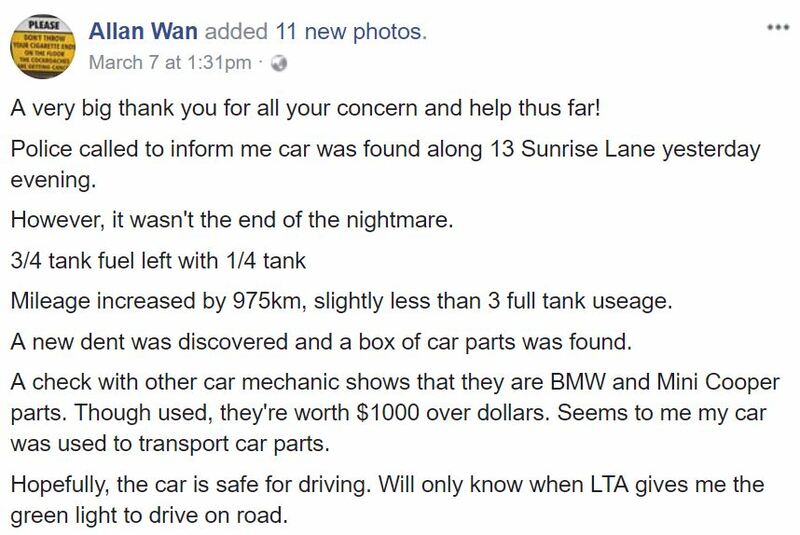 According to Mr Wan, his vehicle came adorned with a new dent, and an increased mileage of 975km, or about 3 full fuel tanks of usage. 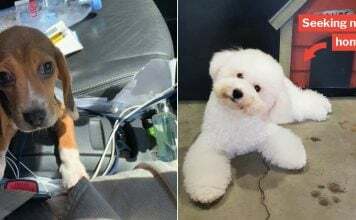 Found inside the car was a box of car parts — which were identified as belonging to BMW and Mini Cooper vehicles. Despite being used parts, they were estimated by another car mechanic as being worth more than $1,000. Looks like somebody’s car was used to transport car parts. At the moment, there’s no further update about what really happened to Mr Wan’s car while it was missing. Since it was used to transport car parts, is there possibly a syndicate using stolen cars to transport used car parts? Or did the workshop simply use Mr Wan’s vehicle as a goods vehicle? Whatever the case, we’re glad that Mr Wan managed to find his car, and that the police nab those behind this soon. 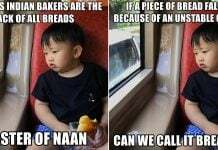 Featured image from Allan Wan’s Facebook and Allan Wan’s Facebook.